We are currently not providing this program. Please go to our Lending Library site to order kits. CCMR’s Educational Programs Office (EPO) and the Ithaca Sciencenter Museum have formed the Homeschool Science Program (HSP) partnership. 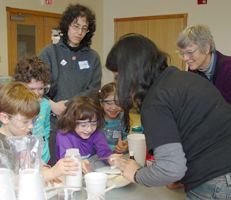 This program, which presents materials science workshops, takes place at the Sciencenter in Ithaca, NY. The science workshops are hands-on and encourage students to explore how materials interact with each other. Workshops are led by Cornell faculty, post doctoral associates, graduate and undergraduate students. The program runs during the school year, select Wednesdays of every month from 2:00pm – 3:00pm in the second floor classroom of the Sciencenter in Ithaca, NY. All programs are free to the homeschooling community and include free admission to the Sciencenter at the conclusion of the workshop. Due to the popularity of the program and the limited space registration is required. To reserve your spot in any of the upcoming activities contact us by email at ccmr_outreach@cornell.edu or by phone at (607) 255-9547. Please be sure to include the name and age of the participating child, name of the accompanying adult and either a contact email address or phone number. Workshops are recommended for children ages 6-13. We ask that parents accompany and participate with their child(ren) so that it is a family learning experience.